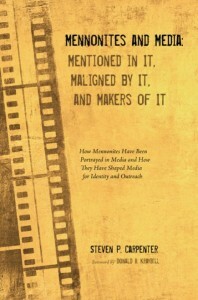 Steve Carpenter’s book, Mennonites and Media: Mentioned in It, Maligned by It, and Makers of It (published through Wipf and Stock, 2014) is based on Steve’s recent thesis towards a Master’s of Arts in Religion from Eastern Mennonite Seminary. As a writer and editor, when a friend or colleague writes a book, do you review it? How can you be fair, objective, and also supportive? When that book is about a field you have worked in all of your life, how can you be detached, unbiased and dispassionate? I’ve known Steve through his work for probably about 15 years. He worked for Virginia Mennonite Conference in development and as conference coordinator, and currently works in a development capacity for MennoMedia. (Also my main employer.) He wrote media reviews for Third Way website for many years under our “Media Matters” column which I edited. Steve is a fine, dedicated writer whose love of and fascination with film helped him produce excellent film reviews for Third Way with a knowledgeable and critical eye. He also did film reviews for the Shaping Families radio program I helped produce for three years. A true film buff who loves nothing more than getting a lively conversation going around the latest flick, his thesis and book marries his dedication to the denomination he discovered as an adult, with his love for films, books and media, topped off with an ample serving of Anabaptist/Mennonite history. Steve comes to Mennonite/Anabaptist history and media with a fresh perspective as a first generation Mennonite who graduated from the U.S. Coast Guard Academy, where he served as an officer in the Coast Guard. How many Mennonites do you know with that kind of background? He is now a dedicated pacifist—the creator of a bumper sticker which saw some popularity proclaiming “Blessed are the peacemakers–Jesus” with a website url for Third Way. If you’re going huh, huh, huh and huh? you perhaps don’t walk much in the very small subset of people who get excited by this topic. Steve’s index and bibliography are worth the price of the book if you’re in need of a reference tool besides Google for this esoterica. In a nod to the scholarly nature of the work, Steve uses the Ngram, a web-based tool which traces the frequency of how often certain words turn up in print over the centuries, and relates spikes in frequency of words like “Mennonite” and “Anabaptist” to publication of key Mennonite/Anabaptist books. Since master’s theses specialize in topics no one has quite tackled before, this book deserves study as a basic or supplemental text for communications and media studies in Mennonite-related colleges and universities – or any ministry student who combines a love of theology and Christian pacifist history, with media. Voltaire, author and playwright in the mid 1700s, features an upstanding Anabaptist character in Candide named Jacques. Candide is the main character in Voltaire’s satirical novella. An Anabaptist chaplain is a main character in Joseph Heller’s classic Catch-22. In current times, radio’s Prairie Home Companion founder and main star Garrison Keillor often tells Mennonite jokes, especially if on similar themes of Minnesota Lutherans. Bestselling author Malcolm Gladwell’s recent reconnecting with Mennonites. Steve is mostly focused here, as you can tell, on media productions produced in the secular realm, but also spends some time noting briefly why he doesn’t examine well known in-church produced media. Therefore he does not scrutinize or catalog much in the way of church-produced media which is the realm of MennoMedia and the agencies that preceded it under various names. So I’ll forgive Steve for not mentioning one of the biggest shapers of in-church media over 40+ years, Ken Weaver, from the mid 50s to the late 90s. Perhaps that’s because Ken was a CEO, and not a producer with his name on a line of books, radio programs, or TV spots. At times Steve’s examples seem to hopscotch between print, film/TV and aural/oral, with a heavy emphasis on print. Steve includes a brief nod to online media and even evangelical roadside signs. The book is rich in examples yet I was always aware that the formation of the book was and is scholarly with the purpose of original research and documentation towards a master’s thesis. As such, I commend it heartily to communication and Anabaptist history students, professors, and even pastors or teachers who enjoy preaching and teaching using current or past examples from media. It might provide an interesting small group or Sunday school class study over a series of weeks, playing/watching samples and then discussing Steve’s analysis compared with their own. In this book Steve illustrates the powerful influence of media on our culture over the past 500+ years. In college when Fiddler on the Roof movie came out in 1971, I wrote a film review for the college paper. In it I pointed to several touchstones comparing the Jewish storyline to that of Mennonites, and wished for more storytellers to bring to cinema such shining and well-told stories of faith. Steve’s book also illustrates that call and need. 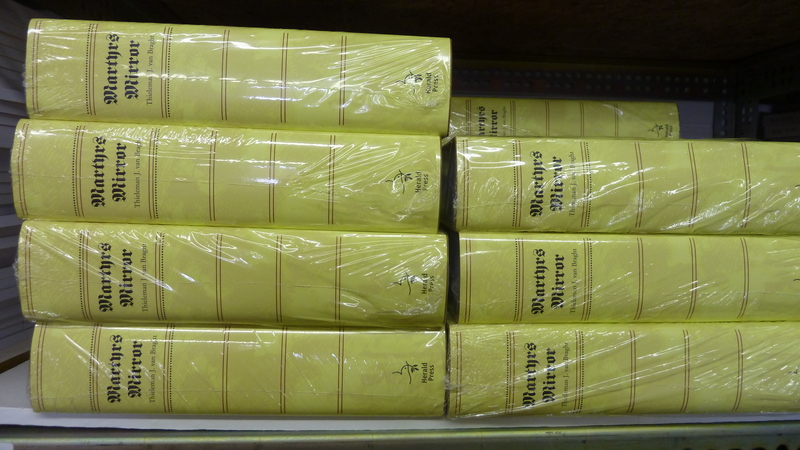 If it were not a scholarly tome, I would have surely begun the book with the ending, where he delves into his personal life and reasons for writing the book. Don’t miss that. 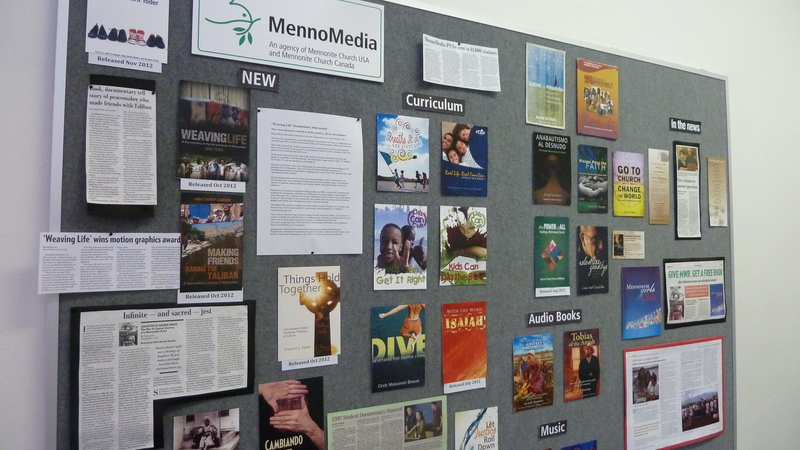 Mennonites and Media: Mentioned in It, Maligned by It, and Makers of It is available on Amazon and other online retailers, and the publisher. What is your favorite example of secular book, movie or other media which does a great job on artistry as well as faith? Thank you for your introduction to Steve Carpenter, Coast Guard officer turned Mennonite author – don’t know anyone else with that resume. I always learn something from your posts. I used to listen to Garrison Keillor’s Prairie Home Companion until our PBS station dropped him. He told jokes but I never detected a Mennonite flavor. And, most surprisingly, your example of Malcolm Gladwell returning to his Mennonite roots – well, I never . . . ! A book combining artistry and faith is Phyllis Tickle’s Graces We Remember: Sacred Days of Ordinary Time. Strictly speaking, it’s not a secular book, but I like the way she blends artful writing and the seasons through the lens of the liturgical year. Don’t you have NPR or your state public radio station you can listen to him on? He runs here on the state college channel. You can also go to the website and listed to the shows from the archive. You can also listen to the show streaming from the computer, as I understand, somewhat. I have listened to him as far back as I can remember. My parents were big radio listeners….Met Opera Sat afternoon…Unshackled….and others…..remnant of radio listening from growing up. There are a lot of Norwegians and Lutherans on the west side of the state where my husband’s family lives plus in the state on the whole. Have you ever seen the CHURCH BASEMENT LADIES plays? My homemakers group just went to THE LAST (CHURCH POTLUCK) SUPPER one a couple of weeks ago. I think that is the 4th in the series I have seen. They take place in Minnesota. I would love to see the Church Basement ladies plays–I’ve seen reference to them on Facebook etc. from time to time. I bet they are a hoot. Sounds like you live in Minnesota. I’ve never been sure, and I’ll probably forget down the line, but I love what you add regularly in the way of info and comeback on these blog posts! Thanks! Glad you could learn something new, this post maybe more than most of mine. 🙂 I just learned something too in the follow up: Richard Kauffman at Christian Century just noted that Malcolm’s parents later became Mennonites, but not when Malcolm was growing up. He apparently has a brother who identified with Mennonites in his youth, but not so much the rest of the family. Sounds like Phyllis Tickle’s book would be one I’d enjoy, for sure! Thanks! Nice review, Melodie. Being one of those geeky people who try to figure out which celebrities have Mennonite connections, e.g., Matt Groening, Phyllis Diller, etc., I’m looking forward to reading Steve’s book. As the article you linked to mentions, Malcolm Gladwell went to Washington Community Fellowship, once upon a time. His parents and brother go to Waterloo North Mennonite Church, and his sister-in-law is a chaplain at a Mennonite retirement community. So the connections are pretty strong. You can actually find a video of Gladwell speaking at Floradale Mennonite Church on the MC Canada/CMU Resource website, CommonWord. Thanks, Dave–your comment caught me when I was mostly off line for a few days! I’ll make sure Steve sees your comment! Glad to know some of the official (and now strong) connections. Very cool. I will check out the Gladwell video and try to share it on Third Way Facebook page sometime. There is a 1957 movie called ALL MINE TO GIVE. It’s a true story of immigrants in Wisconsin and the faith of little children in the face of family troubles. It’s often shown around Christmas. We live in Wisconsin and have been to the Eureka where the movie takes place. Athanasia, did the movie include Mennonites or Mennonite immigrants? I’ll pass this info along to Steve. Thanks!